If you are willing to participate in a driver's course designed inclusively for the mature driver, not only will you enjoy extra savings, you may also keep your driver's license way into the future! 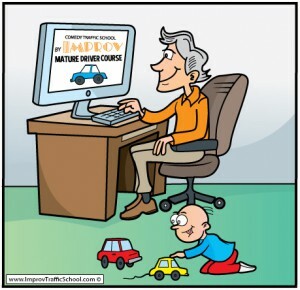 By volunteering to enroll in a mature driver course, you can review the basics of driving in a fast paced environment while quickly collecting dollars for your savings account. Each mature driver training course is different. Our course highlights helpful driving techniques to keep you safe, a brush up on state-specific rules and regulations and traffic facts- all within a comedy-themed format! We keep the content fresh and sprinkle in fun, educational as well as entertaining videos throughout the program. One of the main objectives in taking a drivers safety course designed for the sophisticated adult is the review of the basics. Traffic signs and rules may have been updated since the last time you remember perusing that DMV driver's training manual. For the more trendy student, you just may want to jot some of these new rules down and create your own T-shirt or bumper sticker! A driver’s health and emotional well-being are important factors, which affect their driving. As you mature, your senses can change. Your senses are vital for how you will interact with the environment. As you participate in a mature driver's safety course, you will learn how to handle other driver’s current health limitations as well as any you may have. Hearing and vision loss will affect the way people drive and in some instances, the limitations will affect their response time. Once you are able to understand various limitations that others have, you can practice new techniques to aid you while driving. The driver's training course will teach you scanning and cushion techniques. Scanning may seem like a difficult task in the beginning. But after a while, the habit becomes second hand. Learning the cushion method is just one technique you may learn in a Mature Driver Course that will help you avoid accidents. This concept is simply a buffer between you and other drivers. The method will allow you to avoid accidents by keeping a safe distance between your vehicle and others. Knowing when to give up your driving privileges can be a touchy subject, and denying you have bad driving skills is natural. By taking the mature drivers course, you will be able to discuss the recognizable signs of when to turn over your keys or a loved one's keys. As you begin to recognize the signs, you can make the decision to turn over the keys. Over the years, more people have taking to the road which leads to heavy traffic and congested areas. You may wish you had the simpler days with less traffic and the roads seemed wide open for miles. But the reality is, bumper to bumper traffic can be found on most major highways. People are commuting to work and school which can lead to heavier traffic times during specific hours. Focusing on the needs of the mature driver, by learning how to successfully participate in highway driving, successful lane changes, exiting and passing large trucks will be discussed in the course. If driving in heavy traffic areas makes you too nervous, avoid the stress and take different routes. To help reduce your stress, go over the safety suggestions on heavily congested areas, ask a family member or friend to drive for you or simply avoid the rush hour traffic times. When dealing with other drivers on the road, you must practice patience and defensive driving. The driver's renewal course will teach you how to deal with aggressive drivers, sharing the road with motorcycles, and tractor-trailers, as well as learning to avoid distractions as you drive alongside other motorists on the road. During the times when these situations occur, you may have difficulty to remember exactly what to do. Ask your driving instructor to review tips on how to recall your lessons. The recall technique will aid you in remembering on exactly what to do during a stressful situation. Over the years, vehicles have changed. You may remember when cars did not come equipped with seat belts. Now, the vehicles have automatic seat belts, air bags, and other personal safety devices. The good thing about the safety features is reduced fatalities during car accidents. 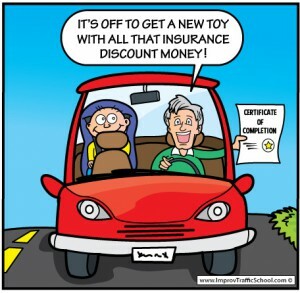 Even though the driving instructor will not be able to discuss every make and model of the vehicle, a general review of all safety features will be given. Learning how to use safety features like anti-lock brakes can help you avoid auto accidents. The initial decision to take a course to receive lower insurance premiums is the first step. Now, you just need to sign up! Our course is designed to help the mature driver while discussing driver improvement and education. 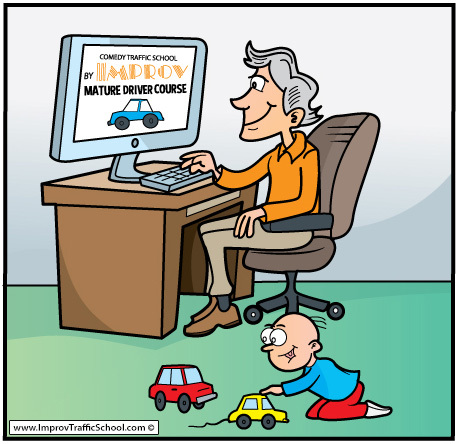 Our online course will cover all the needs of the mature driver. Forget about the idea of going back to class and sitting behind a desk – you can do our course in the comfort of your own home! Choose from your living room, bedroom or bathroom, or all of the above! The Mature Driver Course is designed for the most cultured. You can take the course in two or four-hour blocks, or 10 or 30 minutes blocks to remain interested and comfortable. The online course prevents you from sitting for a long period of time. This option is ideal for those who would like to take the course at their own pace. You can sit at your computer and repeat any sections you need to review and our schedule is flexible in the sense that one can join at any time.